Last we look at some of my books on working wood, time now to look at book about the stuff we are most passionate about, the tools and implements we used to work wood. One of my all time favourite. 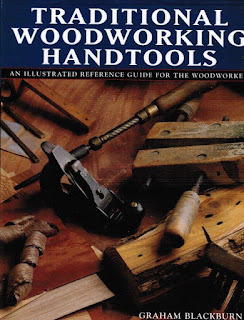 All illustrated with drawings, cover 400 tools, you are probably bound to find the ones you are looking for, since it is all about practical tools needed most. Good write up on the tools development and a good "how to use" them write up, back by experience. Highly recommended. Lark books, (Sterling) 2002, a first edition for a change! Another of my all time favourite. 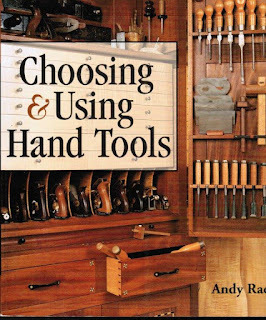 This book by Andy Rae, covers a vast assortment of tools and how to used them, also back up by experiences, just look at his gorgeous tool cabinet. 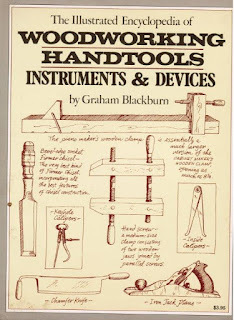 ( I own a set of plans for it :-) Biggest differences with Blackburn book is that this one is illustrated with photography, but also it covers old and modern hand tools. A very well rounded up books, love this book, very well organized. Another take on the previous two books, B&W photographs and drawings, covers a lot of the tools used daily in the shop. Perhaps not as in depth as the others but a good reference nonetheless. 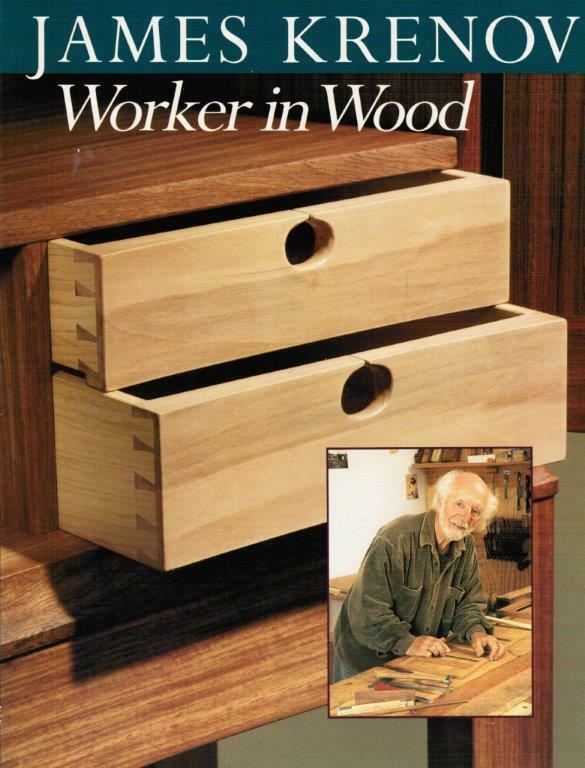 Robert Wearing is a well known and published woodworker in the British magazines. No photographs, but two tone colored drawings throughout. Published by Sterling 1997. 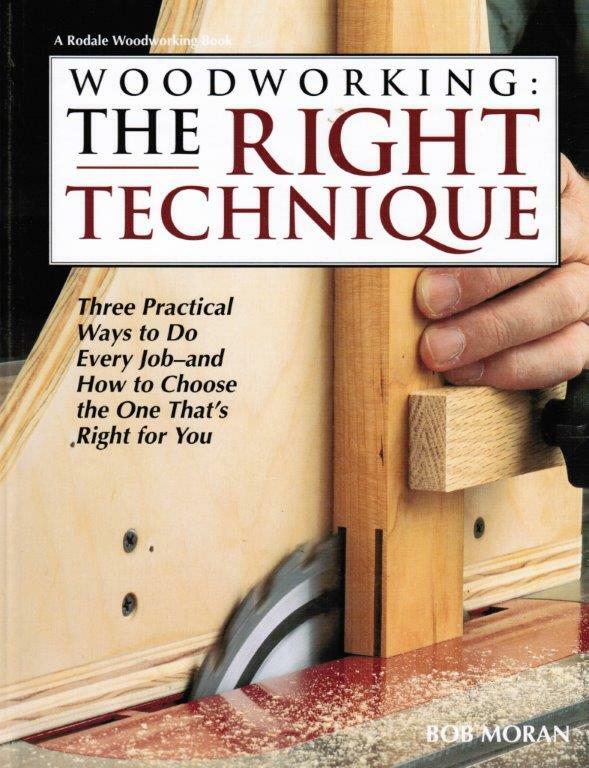 One of the many variations of the above book, but this one is covering strictly woodworking tools. A rehash of the previous one? Perhaps, but updated with colour photographs and drawings. The historical aspect is thinner, but covers some of the common operations. 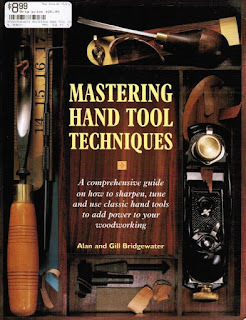 Mastering hand tool techniques, by Alan & Gill Bridgewater. These two writers comes up often in this field, they too have numerous versions of this book throughout the years. Bought this book a long time ago, so did it made me mastered these tools? 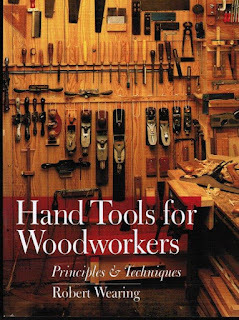 Hardly, but covers 180 tools and wood species within 144 pages, a bit light, not what I would call a ''comprehensive'' book on the subject. 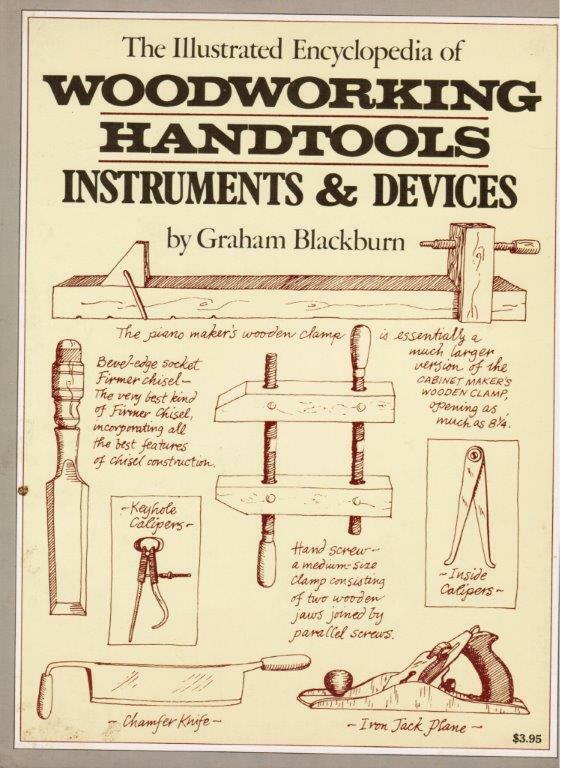 The illustrated encyclopedia of woodworking handtools instruments & devices, by Graham Blackburn. Published by Simon & Shuster 1974. In typical Blackburn style, the whole book is illustrated with his drawings, what is not so typical of his later books, is the uses of his handwritten text, sample on the cover, which makes it a bit hard to read at time. A well researched book of a more historical nature than how to use them. 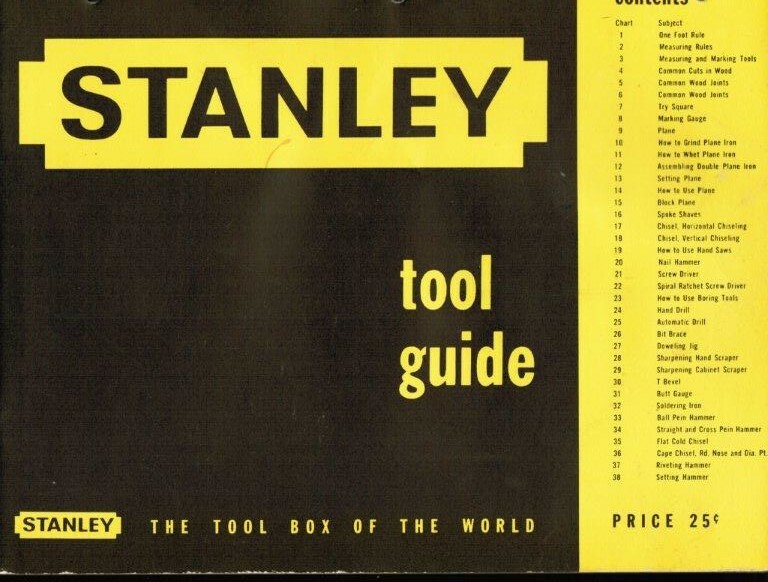 Stanley tool guide, various authors from the company's education Dept. This guide has been republished numerous times throughout the years and given a modernized view by updating some of the drawings. I own 2 more versions of it of older vintages. Lots of information packed in numerous chart style format. 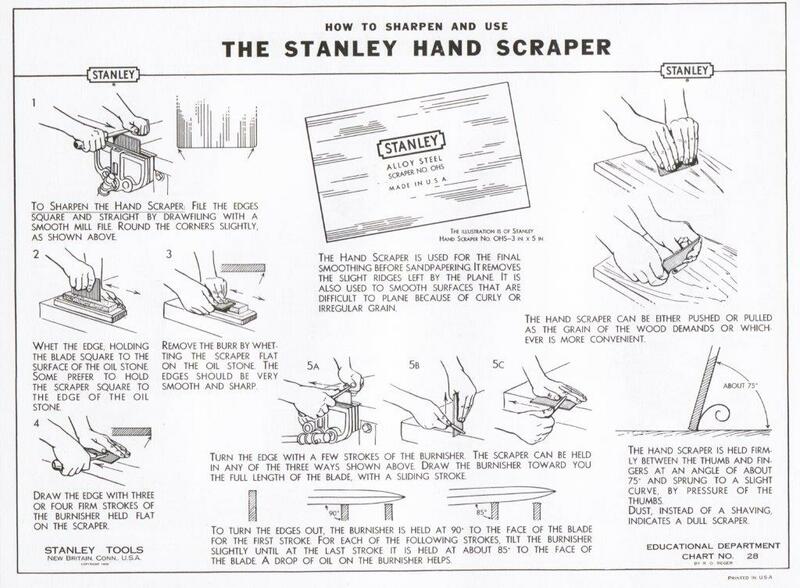 Since Ralph is learning to sharpen his scrapers, here is the two charts on this subject. How to work with handtools and wood, edited by Robert Campbell, manager Stanley educational dept. 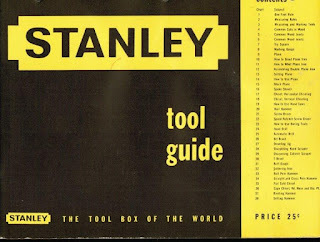 This version Stanley tools work, published by Pocket books NY, 1952, 55 and 65. 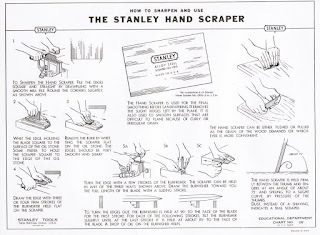 Stanley published numerous books, booklets and etc throughout the years from its educational dept. This book has been published and updated numerous time it is existence. I own an older version of this book., but this is the one you may run into the most in used bookstore, being relatively newer. Distributed from 1927 to the 80s. A complete How to book, also contains plans for bench and appliances and some furniture projects. A little gem often overlooked. Today numerous updated and renamed versions have shown up regularly, here's are some you may recognized, not as in depth coverage as the original version, but cover the basics. Taunton Press 1990. A short collections of articles having appeared previously in the magazine. From the days when I actually like this mag. Taunton Press 2001. 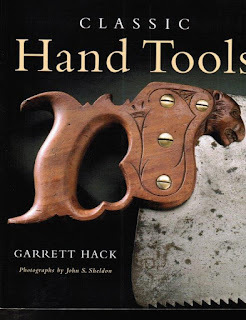 Beautifully illustrated, more than eye candy, it covers some history and hand tool operation by a gifted artisan. Well worth the cover price. The man has a deep appreciation for his tools and it is reflected in his work. Beautifully illustrated by John Sheldon, this book covers many aspect of this tools, from history to use in his work. Love this book. Taunton Pres 2005. 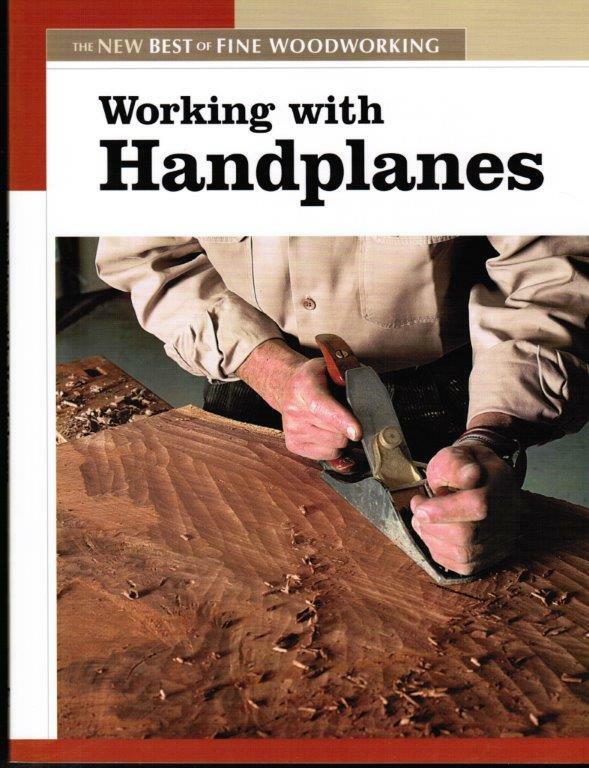 If you have been a reader of the magazine, you have probably read all this collection of articles on the hand plane. Having them assembled together in this format is convenient. The variety of authors covers a good spectrum of techniques from different point of view. Sterling publishing 1993. 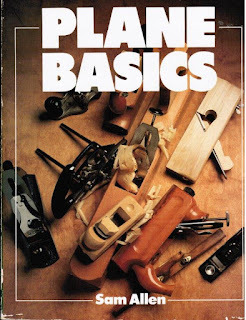 The very first book I ever bought on planes. It did help me eventually figured out and tame the beast, but not at first. Some information's did not register until I had a few failures under my belt. Originally published by C.J. 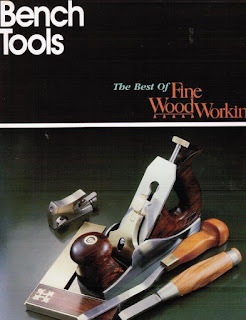 Hampton ltd (Record tools) 1959, republished by Woodcraft 1997. This book as long become a classic on the handplane. 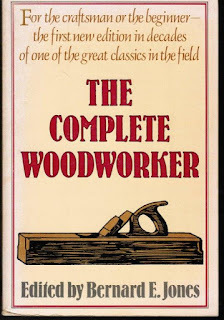 First published in 1934, this is the revised and enlarged 1959 edition, reprint. Contains a good chapter on the history of the plane with B&W photographs and drawings. 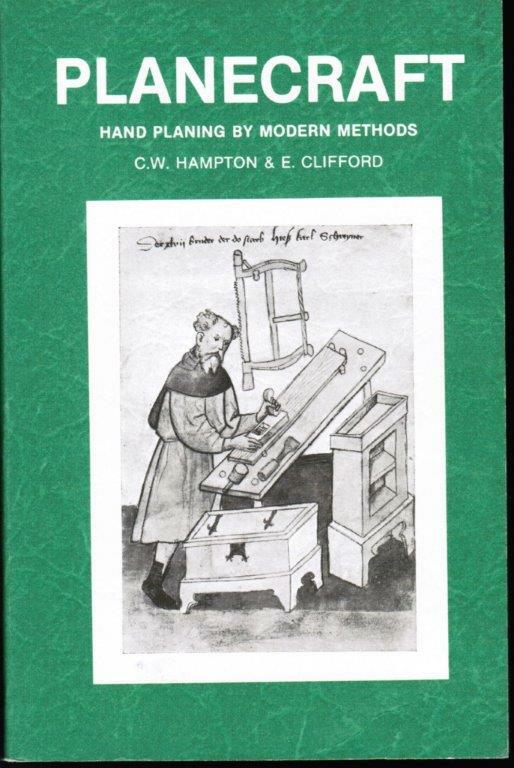 Very complete book on the subject of setting up and using the various handplanes made by record tools. A sampling from my library, you will recognize some I am sure, but there are probably a few you never heard of? 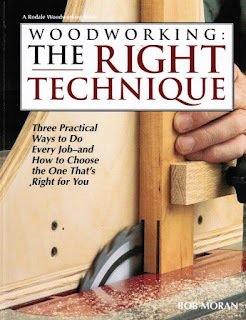 Part 1 BOOKS on Techniques for working wood. 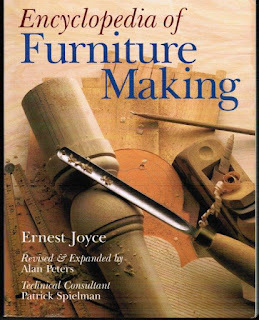 The encyclopedia of Furniture making, by Ernest Joyce. First published in 1970, my copy is a revised edition with Alan Peters published in 1987. This is a very complete book covering just about any operations, joints and etc. 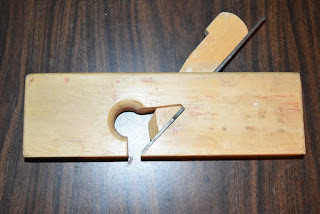 often used as a work book by various school. 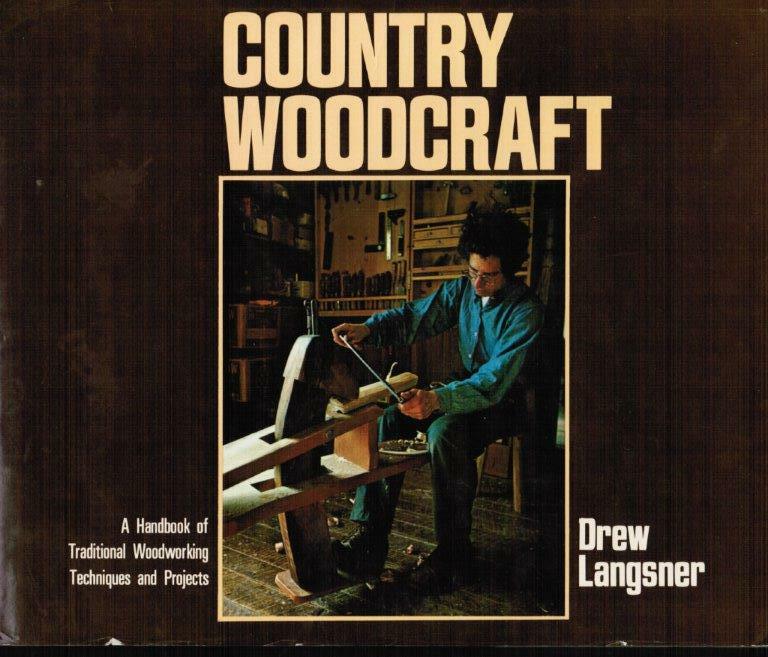 This book was THE required reference for some of the woodworking classes at Rosewood studio, when they were located in Almonte Ontario. They have now moved close by in Perth, Ontario. The complete book of woodworking, by Rosario Capotosto. First published in 1975, mine is a 6th printing edition from 1978. I know, I'm dating myself :-)... 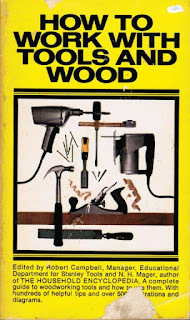 Heavily power tool oriented, typical of the day, it is nonetheless quite complete, from trees to how the wood is prepared to building various furniture design, including wall partitions in a house and some typical house repairs. Not only does it cover the usual power tools such as tablesaw, radial arm saw, bandsaw, joiner etc. but in a nod to the home users it also covers the basic handtools operations and even the Shop Smith multi power tools contraption. Copyright 1954. 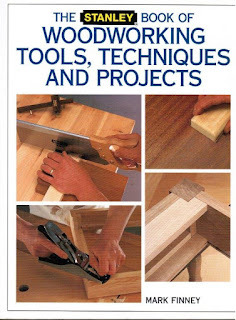 Typical of high school woodworking classes, this book is specially targeted to students and is designed as a classbook, complete with Standard Student Accident Report Form. Throughout the various chapters there are questions with spaces provided for answers. 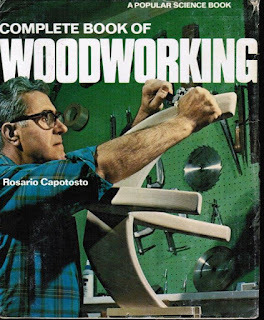 At the back of the book there are a few typical projects which some of you probably did if you attended woodshop in those days. I still have my first projects I build back in the 60s, an octogonal stool and a three legged table. 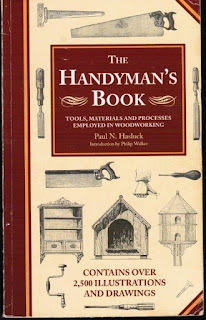 Originally published in 1903, it is a compilation of various work by Paul, who was a very prolific writer in its day. My copy is from Bracken book and was published in 1995. I quite like this book, it is a treasure trove of information on everything about working wood by hand, of course. 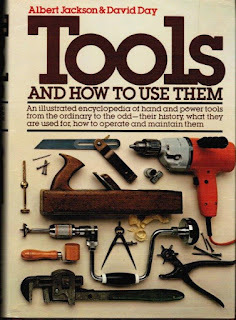 I was first attracted to it for the in depth info on how to use and care for various WW tools, some I never knew existed at the time. This is where I first learn to sharpen center bits and etc. properly. Highly recommended. 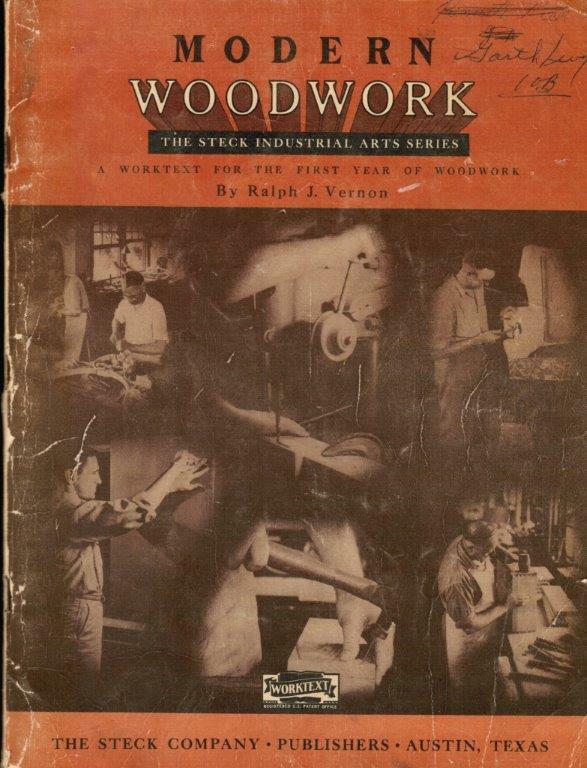 Although, I cannot see any original credit for it, it is definitively 1920s by its appearance and the tools illustrated inside, there is a reference to Stanley Rule & Level Company (1857-1935), and the chapter on making moulding is devoted entirely to the Stanley No 55 (1897-1962), a planing mill in itself. In my humble opinion, you are better to stick with the classics Hollow & Rounds to make moulding, but heh! My copy was published by 10 Speed press in 1980. Published by Rodale press in 1996. 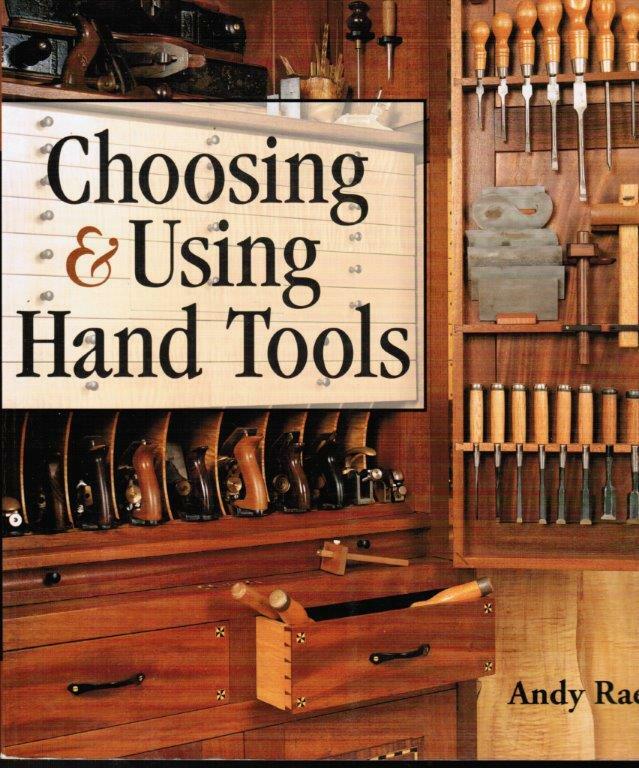 What I like about this book is the fact that most operations are shown using three different techniques, using different tools, either power or hand tools. 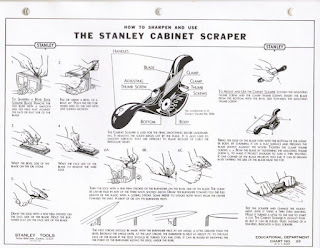 Very neat, it shows you how to get by with the tools you have. It also has a few jigs throughout to facilitate or make safer some operations using power tools. Quite complete. 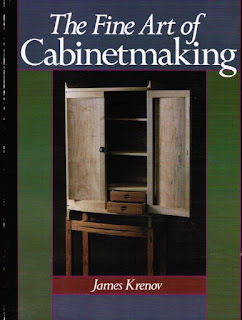 The fine art of cabinet making, by James Krenov. Originally published in 1977, mine is a copy published by Sterling books 1992. 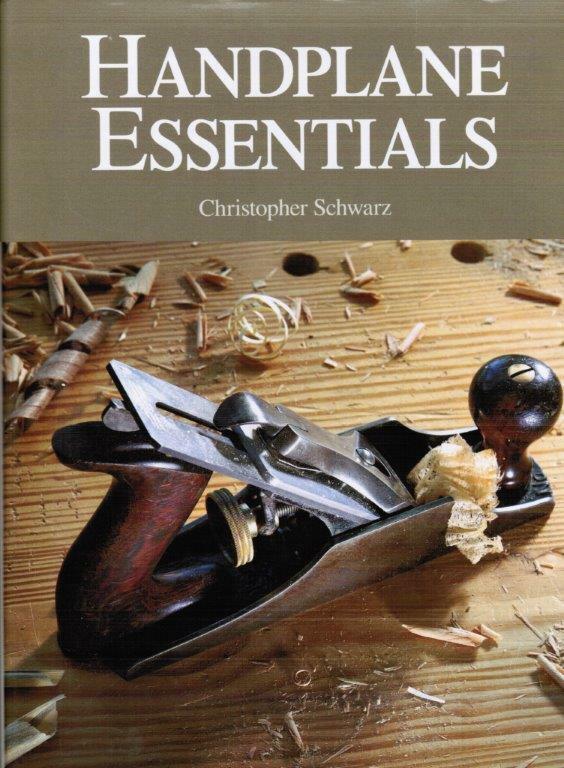 Not quite a How to Book Per Se, it nonetheless covers a few techniques and tool setup, along with his infamous dowels carcass construction method. A very interesting read. Worker in Wood, by James Krenov. Originally published in 1981, mine is a copy published by Sterling books 1997. Definitively not a how to book, but give more insight to his way of thinking and his design process. A nice gallery of some of his work. Furniture-making techniques, by David Charlesworth. 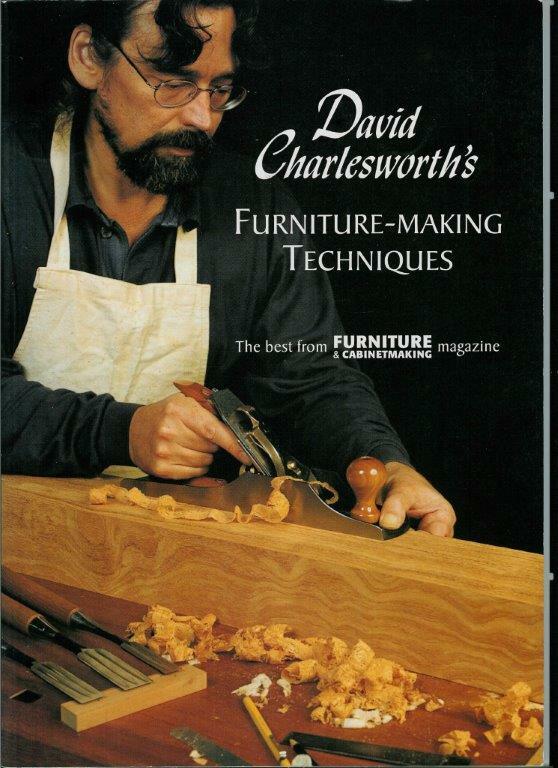 The best from Furniture & Cabinetmaking magazines, a collection of articles he wrote for the magazine. Guild of Master Crafstman (GMC) Publication 1999. Green woodwork, working wood the natural way, by Mike Abbott. 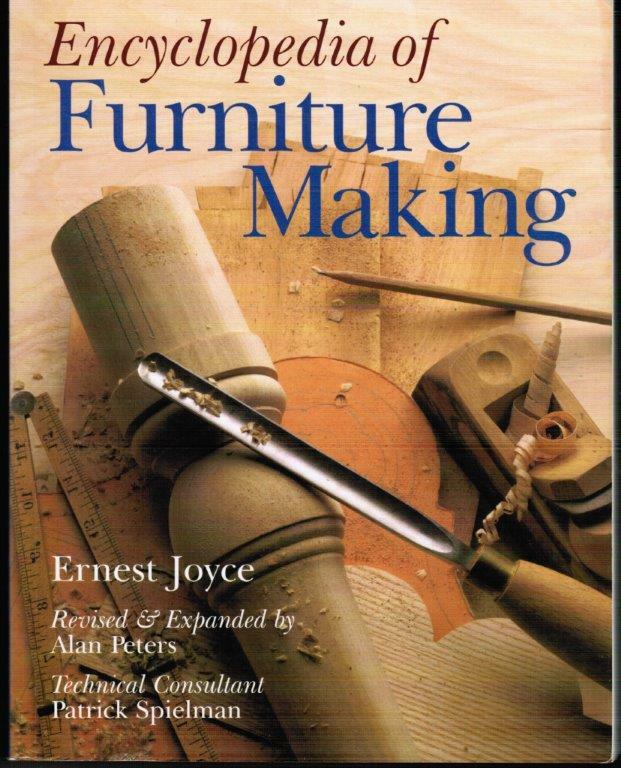 Guild of Master Crafstman (GMC) Publication, first published in 1989, mine is a 1998 publication. 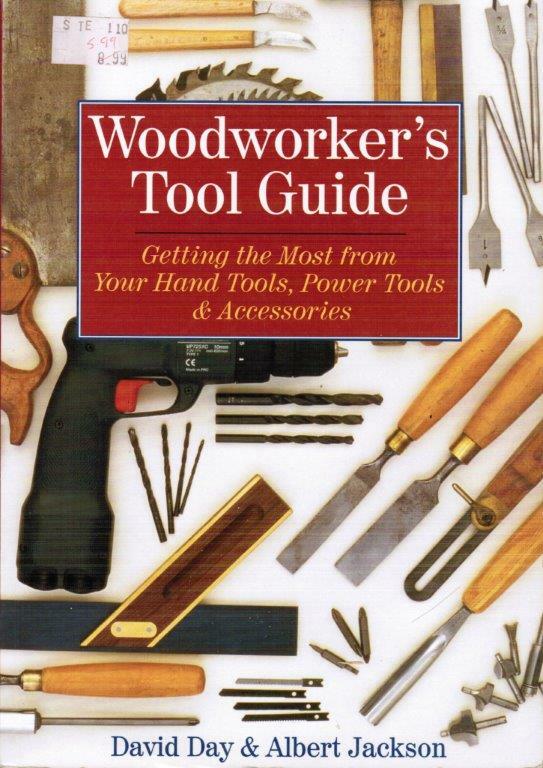 Take a look at the minimalist woodworking tool kit on the cover, I count 11 tools on his tool's tote. Make that 12 with the gouge he is using to turn at the lathe, but it is still amazingly minimalist for sure. 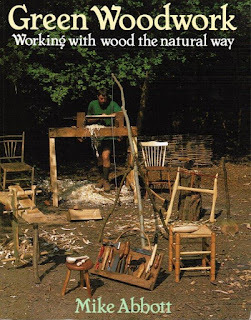 A great book on the subject of working wood, green from a British woodworker. 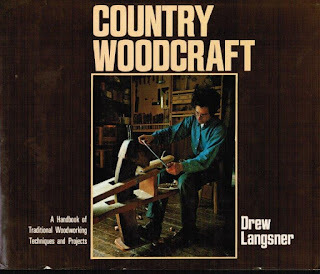 Country woodcraft, by Drew Langsner. 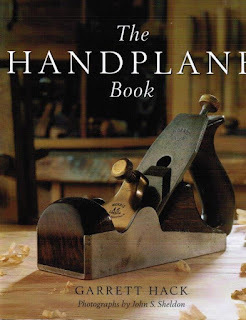 A hand book of traditional woodworking techniques and projects. Peter Follansbee started learning woodworking green with them years ago, need I say more? 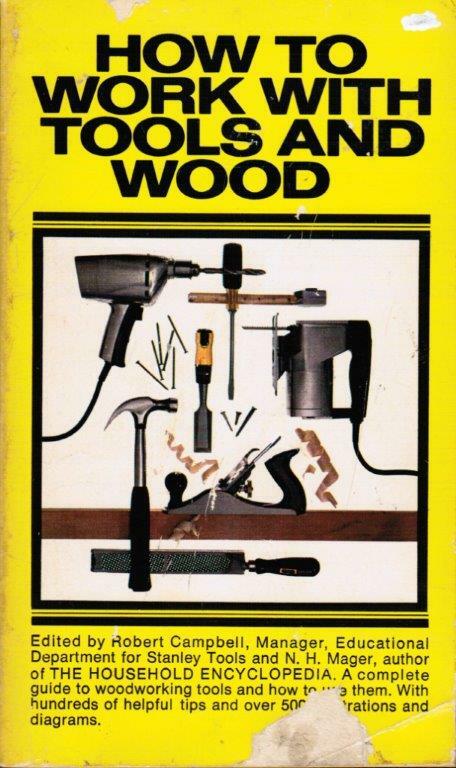 A very well illustrated book showing various details of appliances and techniques to build a variety of green woodwork. 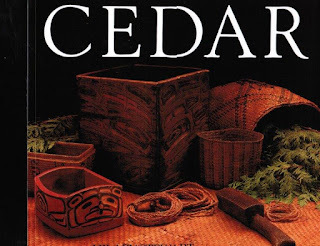 I love this book, because it is all about the mighty cedar tree of our Pacific coast and how our aboriginal people (First Nations) have work this tree for eons, long before us white men shown up on the coast and introduced them to metal implements. Fascinating what you can do with wedges and etc and how you can fell giant trees without saws or axes. 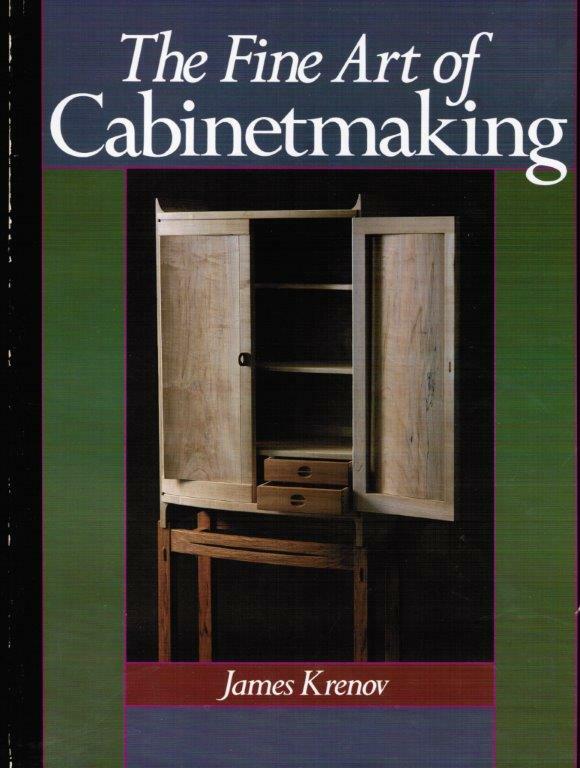 If you want to learn what can be done with cedar, from long houses to small boxes and trivets etc, this is a must read. For those who knows and respect the spirit of the cedar. 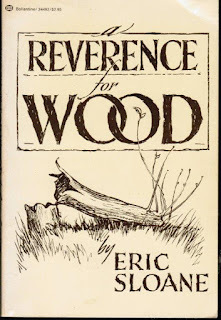 A reverence for wood, by Eric Sloane. 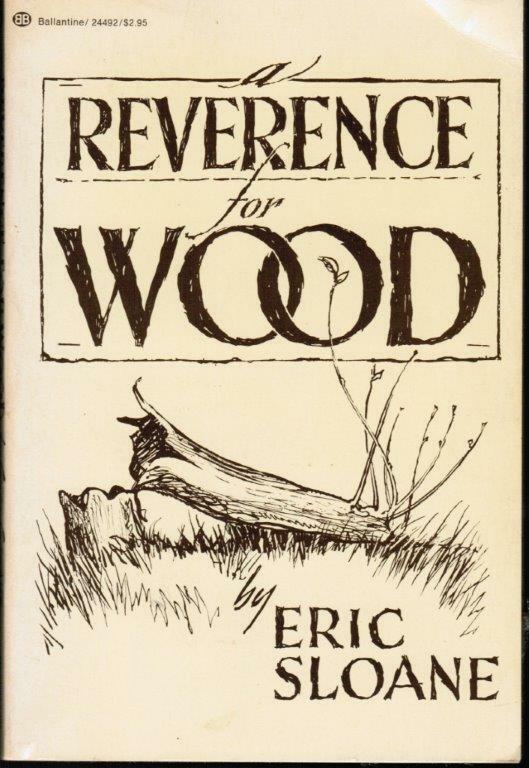 Perhaps best knows for his drawings, Eric published various books of historical values, but none is better known to woodworker than by this book. A real gem depicting the long relationship of man with trees and how various part were harvested for various implements. Contain some great drawings of long forgotten tools and implements, techniques etc. A must in your library! 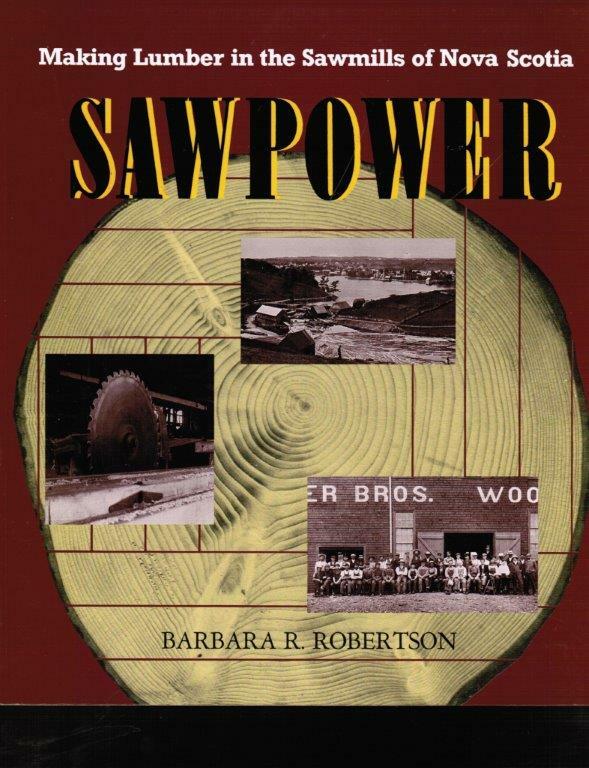 Sawpower, making lumber in the sawmills of Nova Scotia, by Barbara R. Robertson. It covers the technology from the first wind power saw mills to water then steam and electricity and their impact on the traditional pit sawyers and the growth of urban sprawl fuel by the demands for wood. 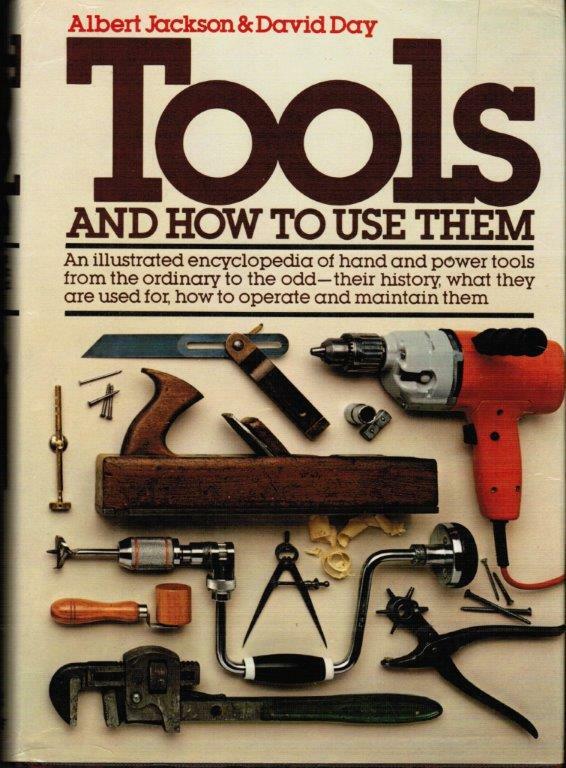 Next part we will look at books on tools from identification, value and how to used them. 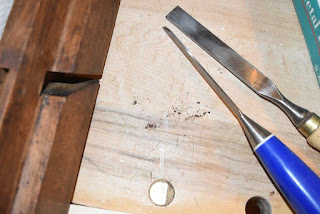 My next posts about using them (building a moulding stick jig and making a Linenfold panel are currently in the holding pattern. Heather is back at home having completed her first round of palliative care radiations. away within weeks to months, no two people being the same. 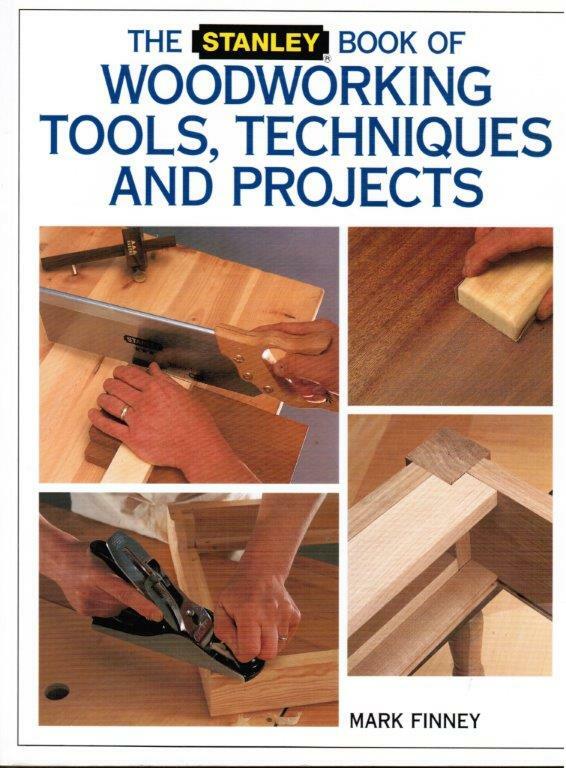 These various angles are to better address the types of wood you are working with. Look at the angles found on a small samples of mines. 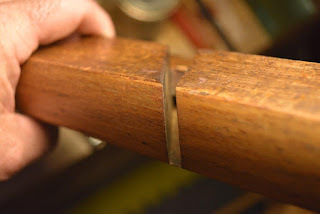 Ralph reported that the one he is sharpening is working so so in pine but make beautiful work in cherry, and has some issues in oak (normal since being more stringy). That would be normal. That one currently with its pitch angle, sharpening level on his blade (he like them shiny), and its bevel angle all are apparently currently tweaked to work better in close grain hardwood (Maple, Birch, Cherry etc). 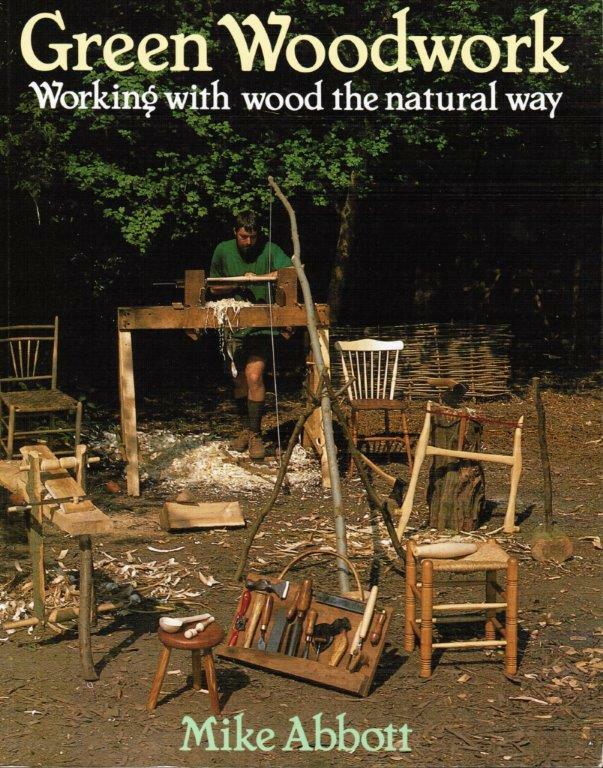 So what can you do different to make it perform better in say, softer woods like pine or stringy woods like oak?? First understand that some of the criteria's affecting its results are fixed (like the pitch of the blade and the blade being straight or skewed. 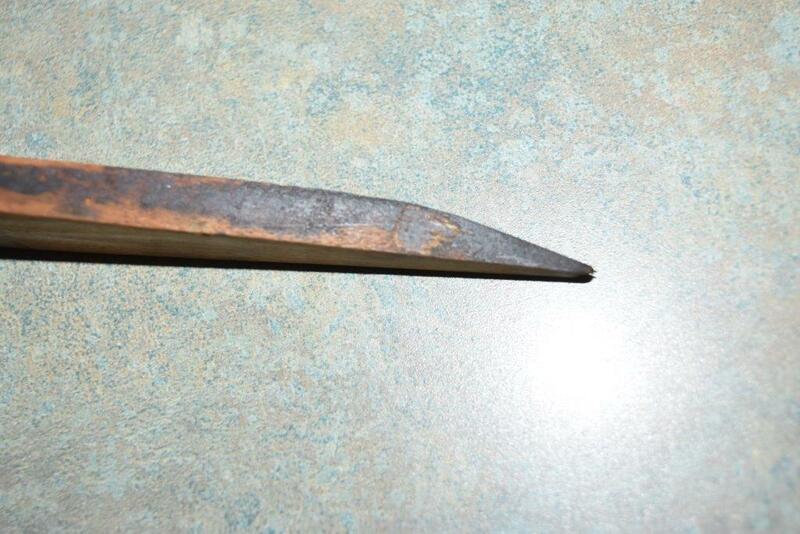 So back to the original question: Just how sharp should you make it? Sharper fix a multitudes of sins, but in this case, it cannot overcome the plane limitations (up to a point). That leave us with the realization that you would need either a different pitch plane, or using a skew iron one. In my experiences, it does not make much differences. The higher the pitch, the more of a scraping action than cutting. What is more critical is how durable that edge is. That's why the blades came originally at various bevel angles between 25-30 degrees. A lower bevel angle, bedded at a lower angle, translate into more of a paring action, I.E. it cuts easier, but the edge is more fragile and can crumble faster if used in harder woods. Conversely in planes with higher bed pitch (toward York) the scraping action is murder on the edge, hence why the bevel angle is raised higher toward 30 to beef up behind the edge (more resistant). 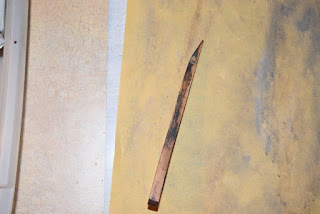 A higher polished blade is going to stay sharper longer, because the level of shininess indicates less visible scratches, it should crumble slower. 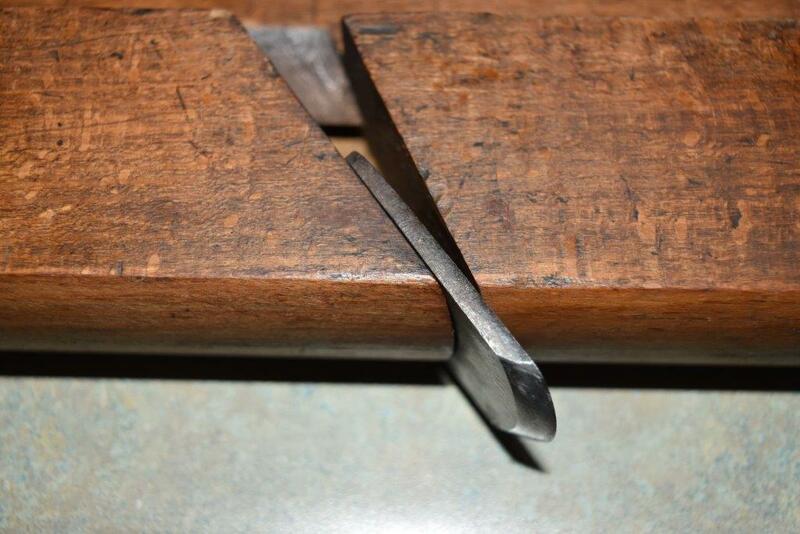 Understand that sharp is simply two FLAT surfaces mating with ZERO thickness. Of course that is impossible to attain, but when you approach that zero thickness, comes a point when you cannot discern anymore light reflection at the edge, because it is then too narrow to reflect light at you. 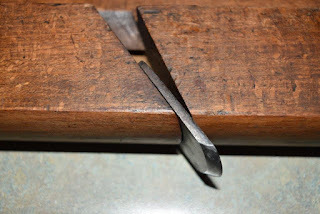 You can work for hours raising that edge to a high level of sharpness, and very shiny, just to kill it in one NY minute by poor stropping action, burying the edge in the leather and rounding the end ever so slightly... And you may not detect it, until you attempt to cut wood. 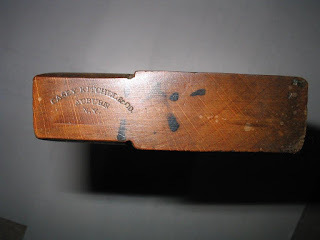 Moulding planes irons profiles poses some challenges sharpening them because of their irregular shapes. 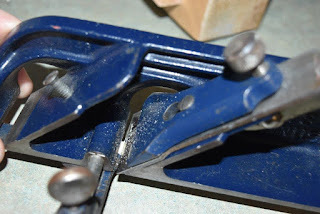 Good news is you only have to touch up that bevel edge rarely after first working on it, you then maintain the edge sharpness by touching only the flat back. Yes occasionally you may have to touch up the bevel to take out chips etc. but not very often if you are careful. 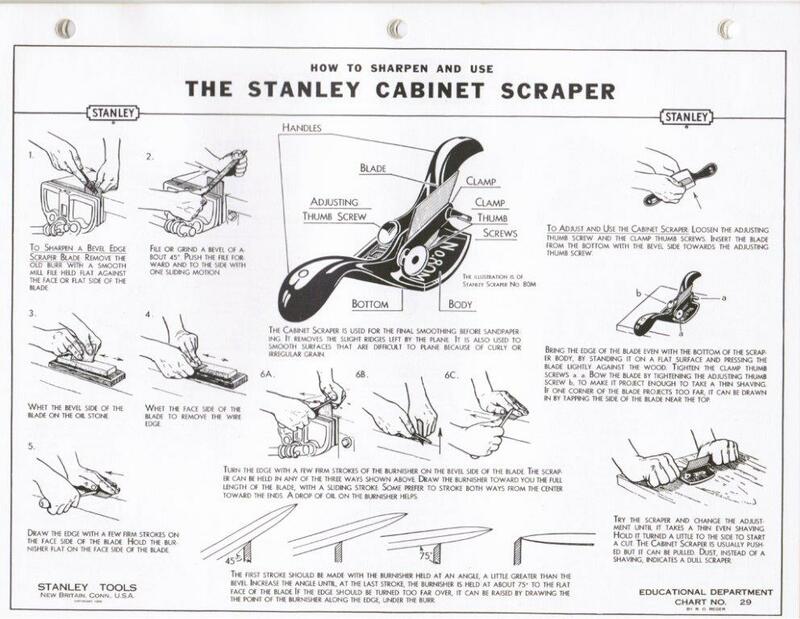 Ever notice that a stock scraper profile is cut almost straight across with a file, then sharpened simply by working the flat faces? 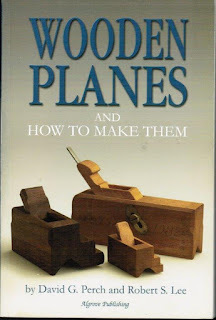 We take a similar approach with our moulding plane's iron. 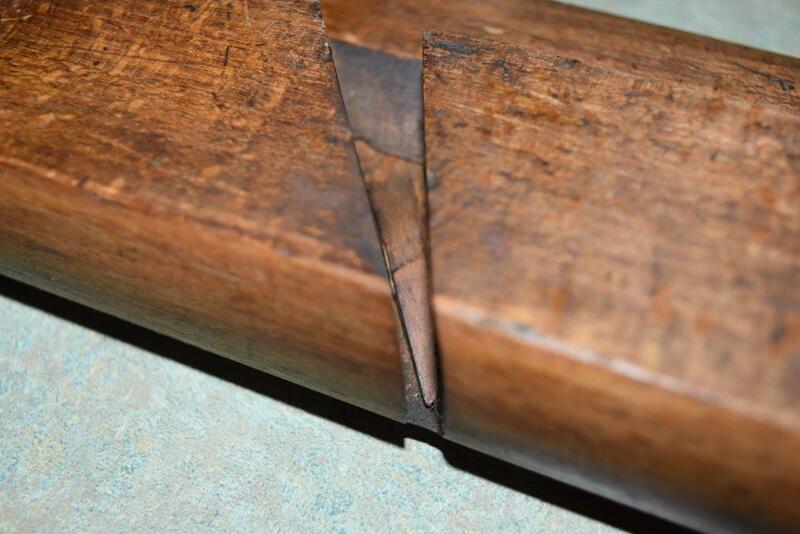 ALWAYS TAKE CARE NOT TO change the profile of the cutter while sharpening, work on the flat! When I originally sharpen mine, I start with 220 Grit sand paper, then move on to my diamond paddles (black and red) and give it a quick strop on a leather strop with LV green compound, that's it! Plenty shiny, (look at the last edge pics on Step 2 initial assesment) When using them, I will then tweak its edge depending on how it react with the wood. This is very much like what carvers do all the time. 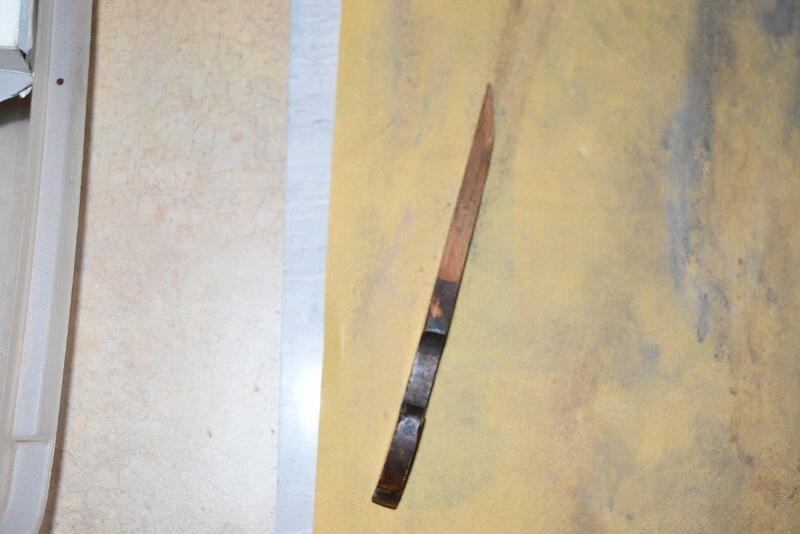 We stop and strop often our edges, changes the bevel angles as required for the wood and the type of work we do etc. It soon becomes second nature and you go thru the steps quickly without thinking much about it. We are talking minutes changes, no drastic modifications requiring grinding a new bevel angle, think micro bevels. Either that OR change tools for the wood. 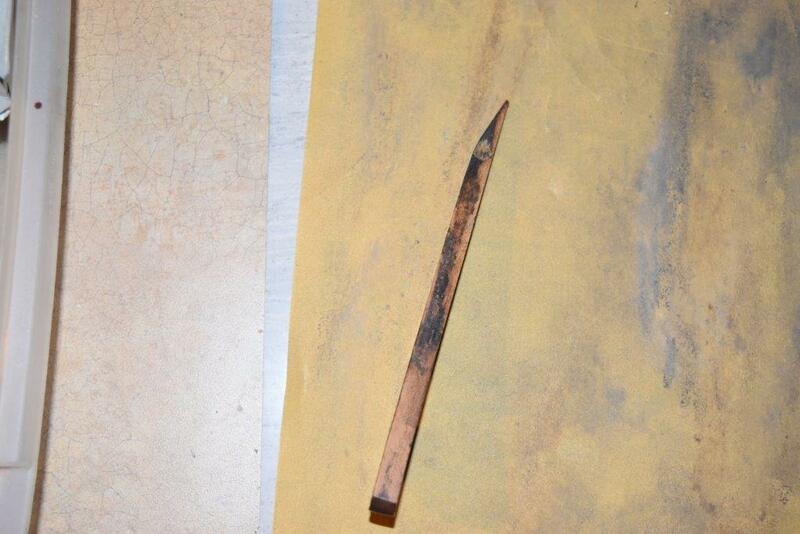 That's why carvers have so many gouges/tools tweaked for various jobs in various woods. 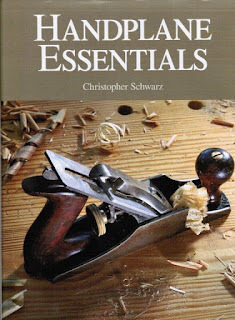 Similarly, you may find you need more H&R of various design (Skew, higher pitches etc) depending on what kind of woods you uses. 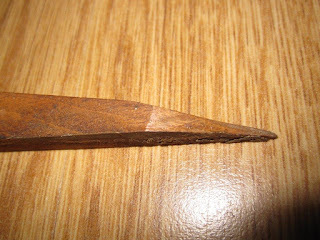 At the initial stage, work on the bevel, ensuring there is no pitting at the edge, go ahead and flatten the back (past pitting at the edge), polish it to whatever degree you like, but since we are often touching up the flat often to keep it sharp, you should keep using the last grit you use or you will kill all that shininess you work so hard to attain initially. Of course the higher the grit, the more work to maintain the edge (slower). SOOOOO, we have to find a compromise between blinding shiny and shiny enough to work and easy to maintain. 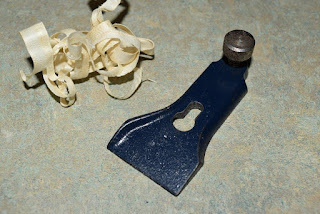 Truth be know, moulding planes do not required super sharp edges to work correctly, so don't waste you time going nutso on them, make shavings instead and look at the profile left. 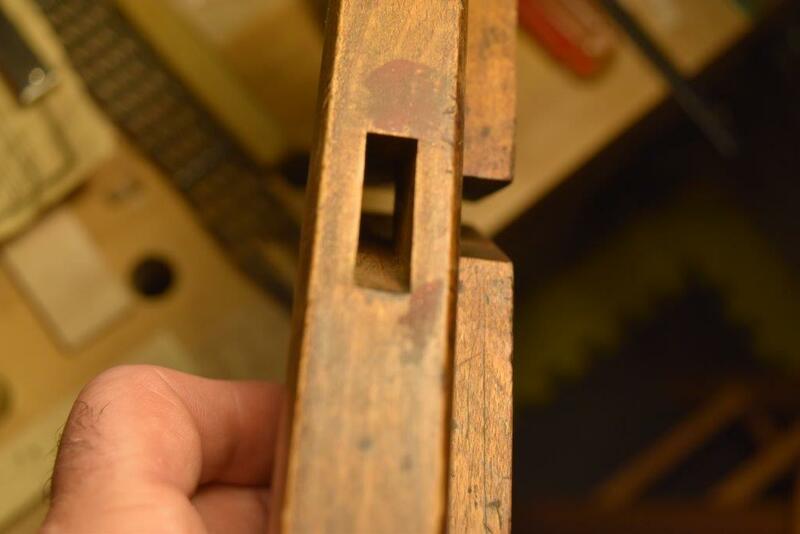 Uses that as the ultimate determination of having achieved the right amount of sharpening for this plane bedded at X angle for this type of wood. And remember stick with clear grain, straight grain woods. Working on the edge of wood (end grain)? Good luck with that!!! Some wood may be possible, but they were never designed for that. Scraping and sanding will fix that surface left on the end grain. All that to say, understand the tool and its limitations. Bob, working at his computer "bench"
I normally would go thru these steps once I have a need or an urge to do it, but for our purpose, we will just keep going. Once the plane has been given sufficient time to fully dry and acclimatize itself to its environment (it is after all wood, remember) it is time to re-assemble it and fine tune its critical parts. First up to bat is the critical interface between the bed, the iron and the wedge locking everything in place. If we cannot get this right, everything else is futile. Here is a different plane to show areas in need of improvements. 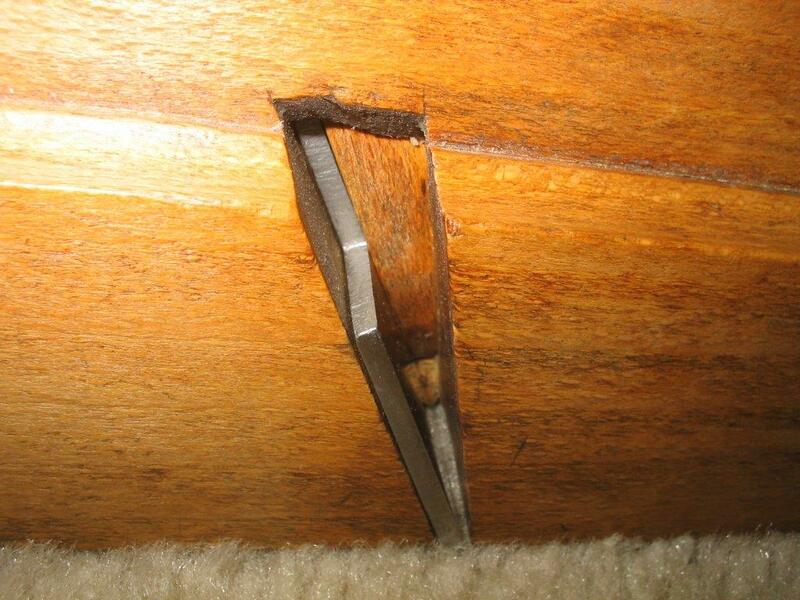 Notice the gaps between the wedge and the blade and the bed. A good visual with strong raking light would reveal any bumps on the bed area. Often, these bumps are made up of rust incrustations and you should be able to scrape them clean. Go easy, we don't want to cause damages, just clean up the bed. Take care not to cause blow out at the critical mouth edge. 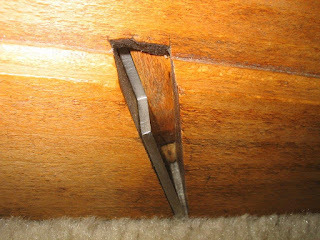 A regular sharp chisel work also but it is too easy to dig in the bed surface, you have to be very careful and methodical. Again and again... less is more. The two sizes chisels I used. 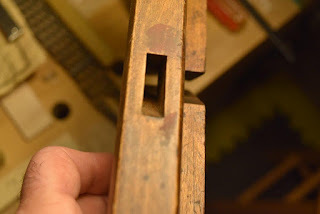 One has to be small enough to fit inside the wedge mortise, the other wide as possible but not too thick to injured the critical mouth area. 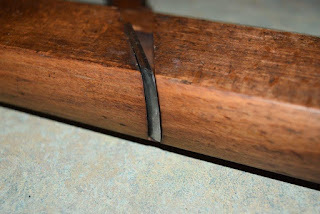 The black crud on the bench is from scraping. That's all you need to remove to ensure a better fit, NOT wood. The black crud is rust incrustations. Next we put the iron to the bed and slide it up and down. Feel and see how it fit. There shall be no rocking ! This may require a combination of touching up the back of the iron, including part of the tang and the bed itself. Go easy, check often. Stop when the blade sit solidly, no rocking, on the bed. Insert the blade as usual, from the bottom. Feel how it slides in. 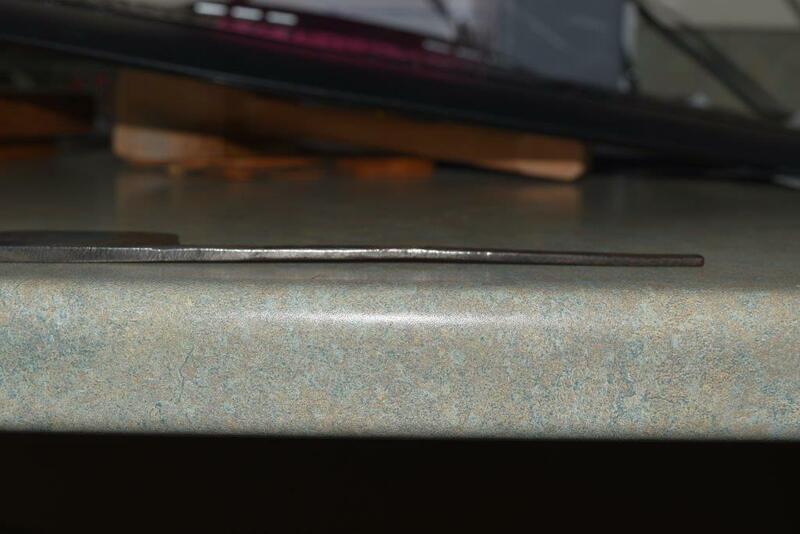 At this point you probably noticed how easy is this to bend the narrow tang. 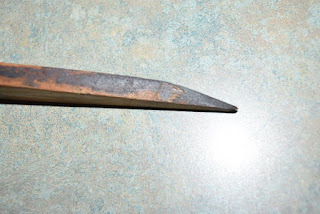 It is made of wrought iron, then there is a small piece of tool steel forged welded at the blade end (on the better blades). 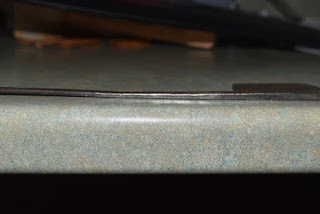 Later blade (not tapered) are sometimes made entirely of tool steel. Easy to tell, the tang would be less bendy and shiny. 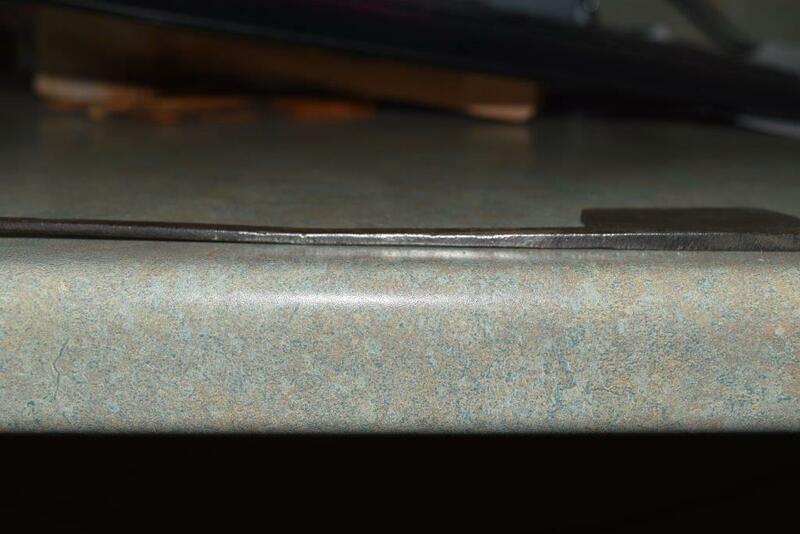 Notice the shiny tang, this blade is all tool steel, bonus ! 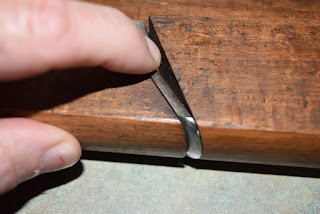 The tang part sticking out the plane stock is not critical, but try to make sure the whole blade is straight, and flat. NO twist. See that small hump, it should be removed...very gently. 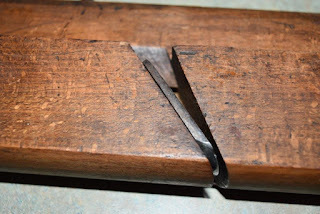 Once your blade is flat where it count, be careful when taking it out of the plane to sharpen it, it is very malleable iron (wrought iron) and it bend all too easily. 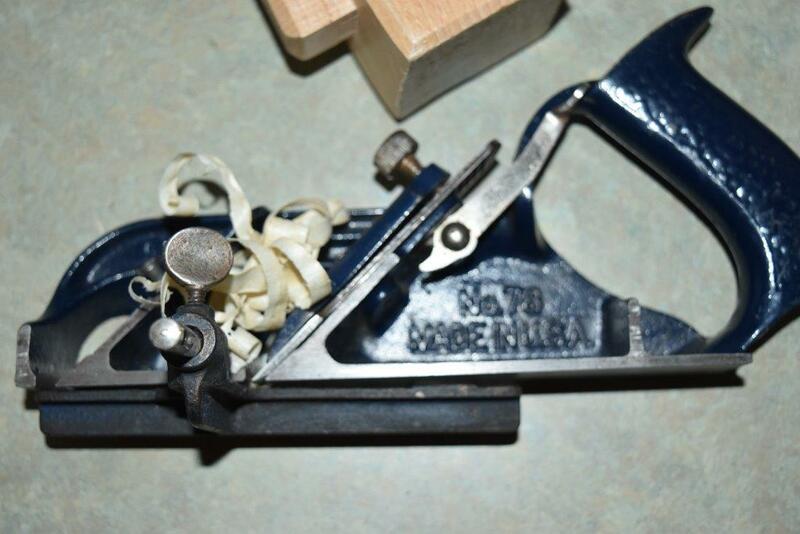 A gentle squeeze in your wooden faced vise would be more than sufficient and easy on it. 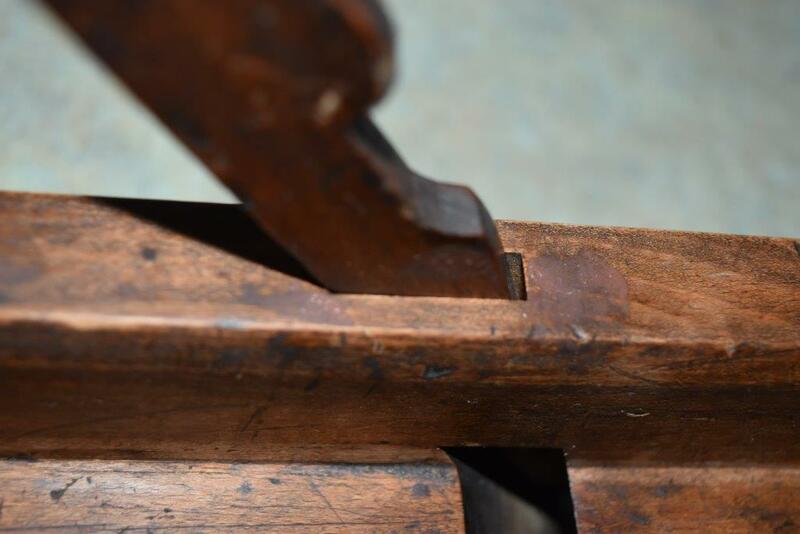 If you tap it with a hammer chances are you will leave marks which should then be sanded out, try to avoid that ! Next we introduce the wedge. 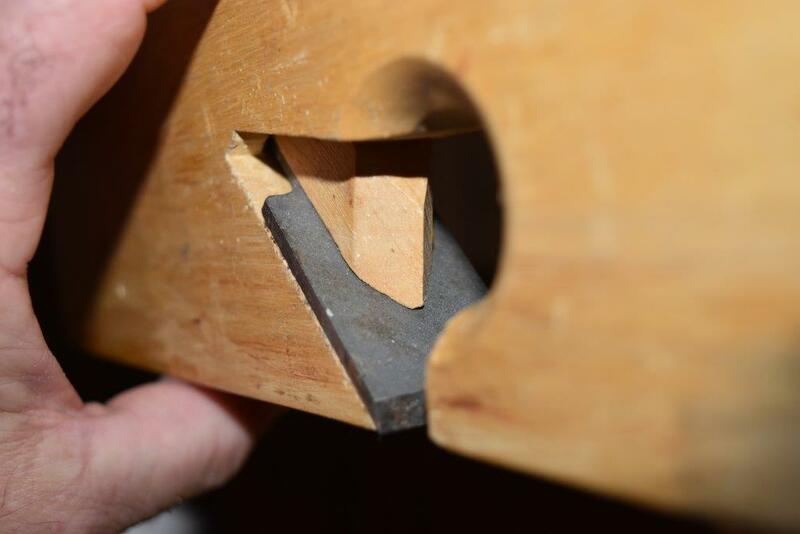 One thing I forgot to mentioned on my assessment part (part 2) is that I check to see how well the wedge fit in its mortise. Reasons are, often the wedge is not original. It either got mixed up (easy to do trust me), broke or got damaged and was replaced. don't force it, just hand pressure. 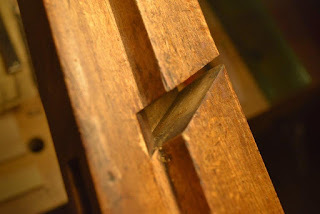 The mortise opening and the wedge are often damaged when trying to wiggle out the wedge. Good time as any to remind you how to properly set and remove the wedge, in ANY plane using a wedge. 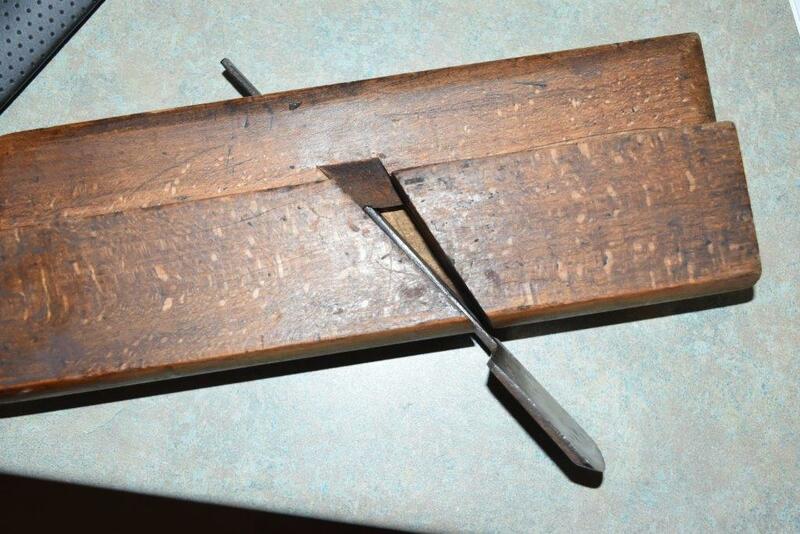 If you rap the back, the blade will retract in the body, but the wedge will loosen and the blade may drop out. 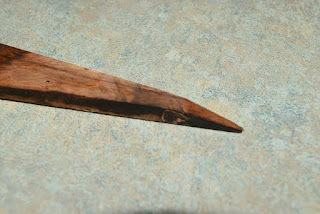 Hint one of my hand is under the blade, or above the wedge if holding the plane upside down,. 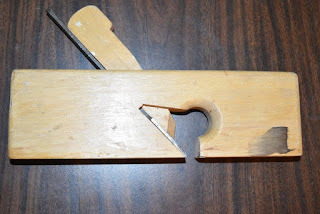 ALWAYS hold the plane anticipating the wedge action so that you don't drop the blade out... And after any adjustment, tap on the wedge to lock your setting. NEVER try to tap out the wedge with blow on the bottom of its round finial. 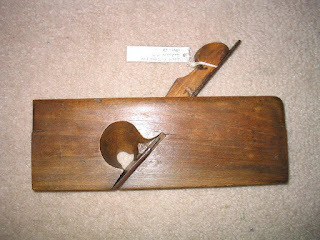 ALWAYS used a wooden mallet (or wooden faced mallet) to tap the body or the wedge. And preferably a metal instrument to tap the blade tang. RULE TO GO BY Wood on wood - Metal on metal. The size of the instrument matter less than you think. A bigger mallet or hammer will not cause more damages than a smaller one, IF you are choking on it and using less force. Too small one and you may have to rap sharper on the body to effect changes. And a smaller faced mallet or hammer will leave ding marks. Bottom line a proper plane hammer is a good thing and a very personal choice. 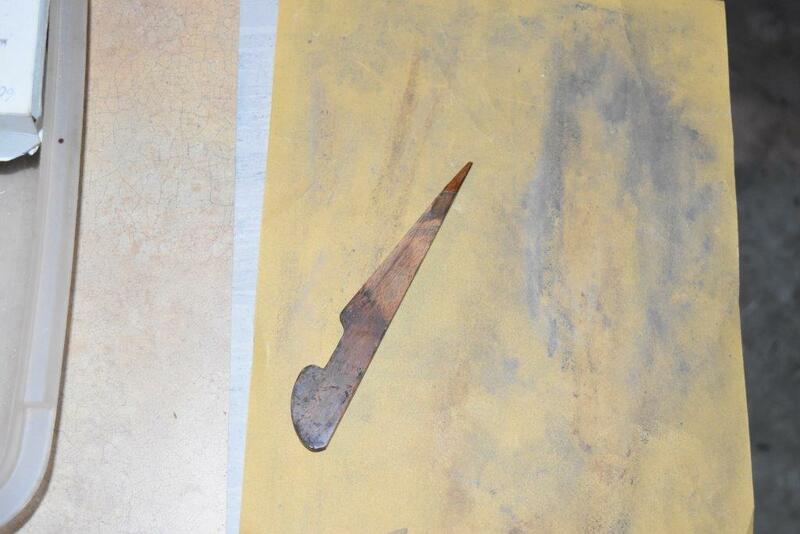 After a while it becomes second nature to tap judiciously the plane body and blade to effect minute changes. Pay also attention to the tip of the wedge, it plays an important role in ejecting the shavings. 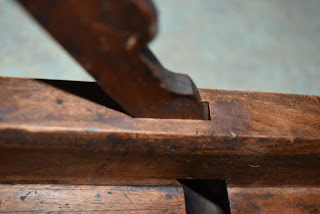 Moulding planes are used at the bench going Right to Left, that means most of them eject their shavings toward the bench (mouth opening on the Right hand side of plane) Others eject on the other side (off the bench) as opposed to bench planes which as you know eject their shavings on the top. 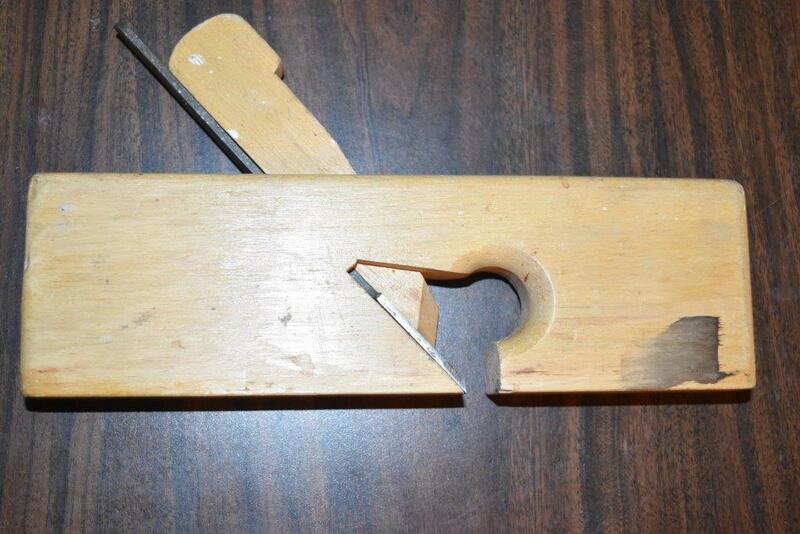 Here is an modern example of a very poorly designed rabbet plane. Are the shavings ejecting to the left? Or are the shavings ejecting to the right? Look at the chunky wedge tip and huge gaping mouth. 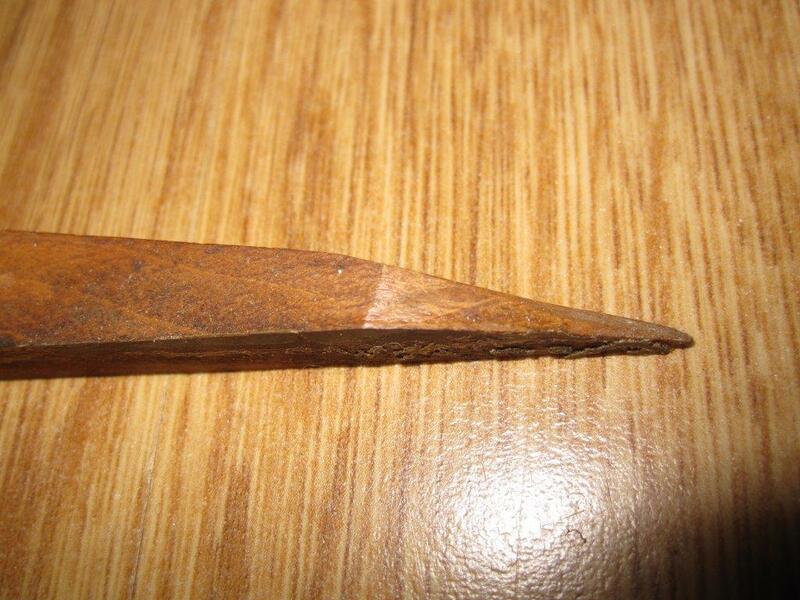 The wedge tip has a triangular tip and the mouth has the same chamfered opening on both sides. Which way are the shavings going to eject? 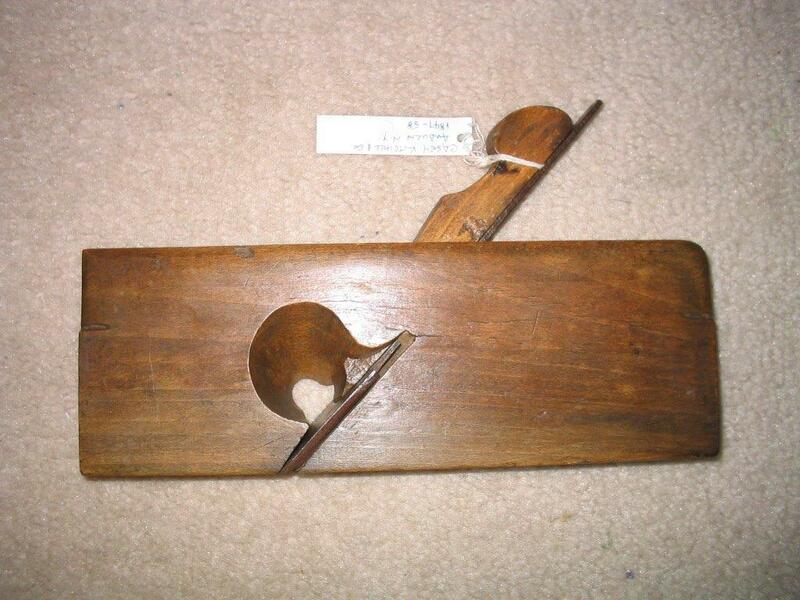 Here is for comparison, a properly executed rabbet plane. This one clearly eject the shavings to the left. 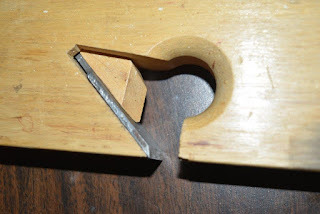 In order to throw the shavings the right or to the left, the tip of the wedge is shaped with a ramp, forcing the shavings to turn right or left. When that tip is broken or misshapen, that function is impaired and the plane will choke. The all too familiar bunching of accordion folded shaving in the mouth. to help curve and eject the shavings better. Is it necessary? A more modern metallic plane such as Stanley No 78 rely on the cap shape (equivalent to the wedge) to throw the shavings left. See the small rounded ridge on the right hand side of the cap? You can clearly see it here. That is all there is to turn those shavings out. And yes, it is often choking with a bunch of shavings piling in up in there. In this design defense, our hand location on the fence contributes to that choking. View from bottom, see the black oxidation spots from the iron. View from top. It should come to a nice pointy end. This is the wedge from the first one pictured at the beginning. That rust incrustation is preventing the wedge to sit properly on the iron and must be removed. I also do a quick pass on all sides. Very gentle pass, I still want to ensure a good friction fit, but nothing to impair, or stop its fitting on the bearing surfaces . With the wedge solidly locked, you should not be able to move the exposed large end of the blade. Wedge is simply pushed in by hand, not locked. Notice how I can move (rock) the blade between both pics. That should not happened if wedge is locking correctly. 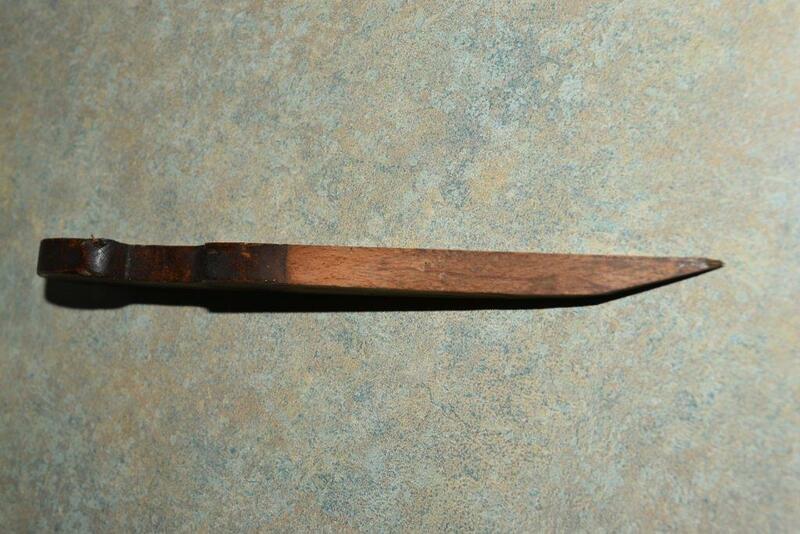 You probably noticed that some planes have tapered irons (older ones) and some have a flat iron (newer ones). The tapered one, work better with the wedge action, because we have in effect opposing wedges. 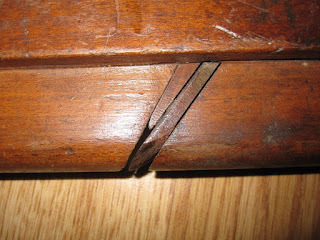 Tapping the top of the wedge locks things up, but the blade trying to push back up from planing wood also lock things up in this case. Makes for a very solid connection! But for all that to work, everything must fit nicely within the confines of the mortise for the blade/wedge. 2- The tip of the wedge is too far up to properly help ejecting the shavings out of the throat. Can you say...choking or jamming! Looking back at the pictures of that modern, poorly designed rabbet plane above, you can guess that it will never be able to work satisfactorily! Watch out for a twist in the blade, it is very easy to introduce twist while sharpening, using a jig such as Ralph's is a big help to prevent that. Once everything is lining up solidly, it's time to check it out. I touched up the blade some more, but understand that moulding planes do not have to be extremely sharp to work. 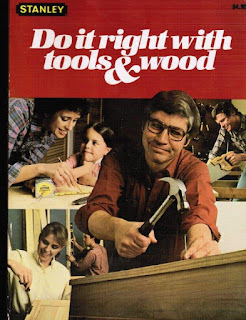 Nonetheless, they should be sharpen for the wood at hand. If it is tearing up, go back and revisit the edge. If its leaving a nice burnish surface, leave it alone. When the edge start to crumble, scratches lines start to appear. Stop and touch up the blade before you need to regrind the profile to go past those scratches. 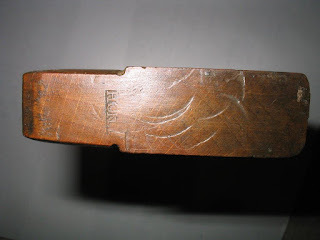 The initial bevel on them was between 25 and 30 degrees. If it becomes blunt too fast, make it steeper (toward 30), if you need it sharper, go toward 25 (shallower). The type of woods you use and the bedding angle (pitch) both affect the ideal blade geometry. Moulding planes intended to be used for carpentry work (mostly in softer pine etc) are bedded at common or regular pitch (45). 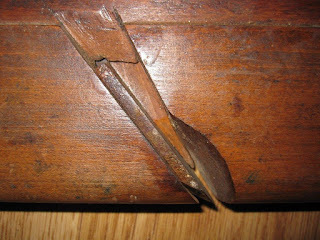 Between higher pitch: 50 (half pitch) and 60 (York pitch), they were intended for working hardwoods. 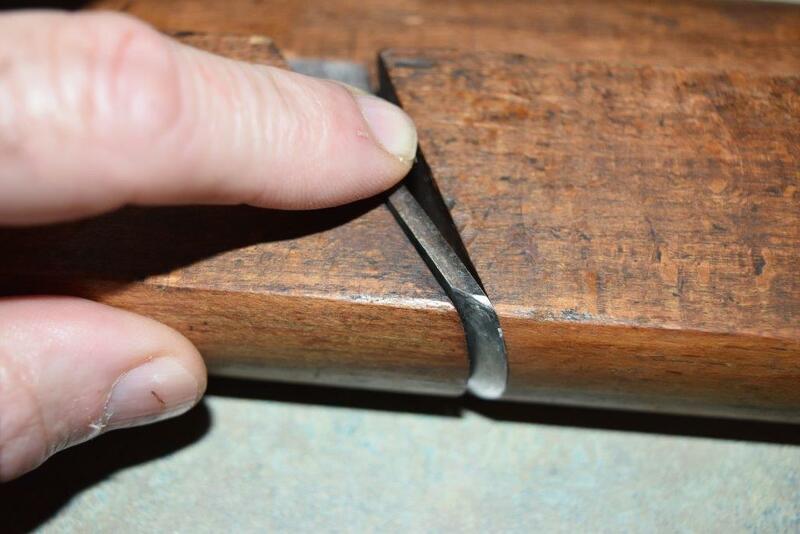 Just remember that every-time you touch up that edge, ensure you did not inadvertently changed the blade profile, nor its width. To change the bevel angle you can use micro bevels. Blade is sharp, bedded solidly. Profile is a good match to the sole. 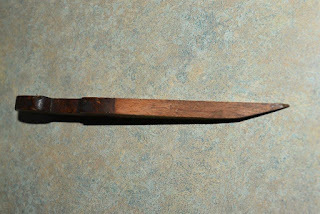 the edge of the blade as required. You could use a fence, but its kinda cumbersome and not always feasible. You need some sort of a groove to help you get the plane started. This is getting rather long so we will see that on the next part. Next will also do something fun to introduce you to the possibilities afforded by having a few of them in your tool chest. - Some pieces of clear straight grain hardwood. Avoid highly figured wood, moulding planes are designed to be used on clear, straight grain hard or softwoods. You get crispier results in hardwoods.